One of the undetermined phenomena of Audible Low Frequency Humming Noise is a low-pitched mechanical buzzing sound often heard in Taos, New Mexico. What makes this strange phenomena worth mentioning is that nobody knows where thew sound comes from. Hundreds if not thousands of people have gone out looking for the source, but it’s never been found. 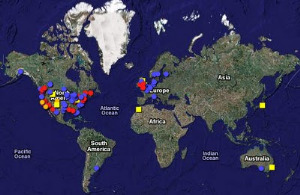 There are lots of theories as to what causes the noise – some say it’s the electronic hum of secret underground bases, while others believe it to have a geological cause, like magma bubbling under a thinner-than-usual earth crust. Still others believe it’s all got something to do with spaceships trapped underground or something. So far, nobody’s ever been able to prove a thing. Let’s kick things off with a quote – this one’s off of Even Tide Productions (.com), who crowned the mysterious humming sound atop their ten most curious unexplained phenomena list: “The hum, a low-pitched sound almost artificial in nature, has driven researchers mad for years. Its driven the locals batty as well, to the point where they banded together in 1993 to petition Congress and ask for government assistance is locating the source of the disturbance to no avail. An interesting thing about Taos, New Mexico – it looks like it’s smack next to Dulce. You remember Dulce. It’s got that alleged underground, alien friendly government base where some say human genomes are being melded with that of animals.The end results are intelligent mutants kept on the inside of a deadbolt. But we totally digress – back to the hum. It’s a sound that reminds people of distant thunder or an idling diesel engine. Not everyone can hear it, which is really enough to make you wonder if it’s an Emperor’s New Clothes types thing. And the New Mexican hum is not alone – there’s one in New Zealand and the UK as well. Then you have Northern Europe where the exact same thing is noted by the locals. In all these situations – there is no apparent reason for the noise. Could that many people be imagining it? Is there a place that would have machinery running that constantly? Could anybody reading this look into at least making the thing more melodic? Maybe program the Beatles‘ White Album into it or something. The following is a paper written by Joe Mullins and Jim Kelly of the University of New Mexico November 22, 1995. Media attention has focused recently on individuals in and around Taos, New Mexico who perceive an irritating low frequency sound that has come to be known as the Taos Hum. There have been persistent complaints of annoying low frequency sounds in the USA and other countries but the group of "hearers" in Taos has been particularly outspoken. In 1993 they got the attention of the New Mexico congressional delegation resulting in a request for an investigation. Many Taos residents feel that the government may somehow be involved in the sound, so the investigation was open and public. One of the authors, Joe Mullins of the University of New Mexico served as the team coordinator. The team included Rod Whitaker (Los Alamos National Laboratory), Mark Leher (Phillips Air Force Laboratory) and Horace Poteet (Sandia National Laboratories) James Kelly, a hearing research scientist from the University of New Mexico's Health Sciences Center, joined the team later to provide expertise on the human ear. Based on interviews with hearers, we determined that any proposed explanation for the hum should take into account its principle attributes. First, the hum is selective. Only a small percentage of Taos residents perceive it. Second, the hum is persistent since most hearers perceive it on a weekly basis. Third, the source of the hum must be widespread since hearers perceive it throughout the Taos area and we have received letters from all over the country describing a similar phenomenon. Fourth, the hum is invariably described as low in frequency and reminiscent of a distant pump, an idling diesel truck, or perhaps someone's high powered audio bass running amok. Hearers who are musicians identify the hum as a modulated tone near Eb (41 Hz) and those with some technical background identify it as an amplitude modulated sound with a carrier frequency ranging from 30 to 80 Hz. We decided to supplement these anecdotal descriptions of the hum with psycho-physical matching tests using known hearers before we proceed with our search for the source. The results of these tests were both intriguing and puzzling. The carrier frequencies selected by the hearers ranged from 32 Hz to 80 Hz. 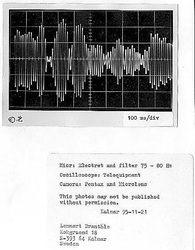 The modulating frequencies they chose ranged from ½ to 2 Hz. All chose amplitude levels near or below the known sensitivity of the ear in this frequency range. But the most striking thing is that hearers could still perceive the hum in the presence of a relatively flat noise spectrum when the matching signal was turned off. Fig 1 shows a representative sample of the noise background in the Saltzman's rural home at 7,000 feet above sea level recorded with our "big ear". 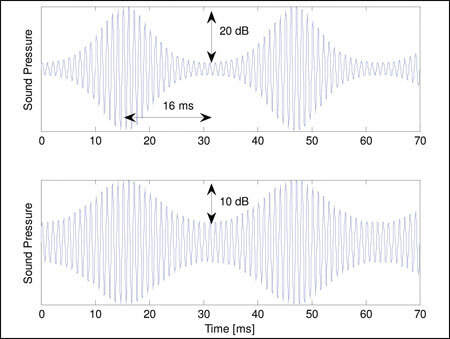 The noise amplitude when converted to 1/3 octave bands, is 15 to 20 db below the accepted threshold for hearing in this frequency range. This suggests that the hearers are not extracting the Taos hum stochastically from acoustic noise. As a result, we are left with a mystery. There are no acoustic signals that might account for the hum nor are there any seismic events that might explain it. There are no unusual lines at suspect frequencies in the electromagnetic spectrum recorded near Taos. In fact, other than the signals generated by the power grid or in the case of the golf course, a power generator located at the course headquarters, we found no clear lines at all in this spectrum. At a more fundamental level, there is no known mechanism whereby weak electromagnetic signals might even be transduced selectively by the human ear and perceived as sound. Our next step, therefore, was to shift our emphasis from the physical environment to the hearers themselves. We first wanted to determine what fraction of the people in the Taos region are affected by the hum and to probe the characteristics of their perception. To this end we sent survey forms concerning the hum to 8,000 residents in Taos and Ranchos de Taos and the neighboring communities of Tres Piedras, Questa, Eagle Nest and Penasco. These communities represent respectively points to the west, north, east and south of Taos on a circular perimeter roughly 40 miles with Taos at its center. A total of 1,400 residents in these areas responded to the survey and 161 respondents were classified as hearers. Most of the hearers (72%) are between 30 and 59 years of age and there are approximately equal percentages of male (52%) and female (47%) hearers. The hum is perceived by most hearers (62%) between 8 pm and 9 am. About 80% of the hearers perceived the hum at least one a week and, as shown in fig 2 a hearer's first experience with the hum usually occurs in the immediate vicinity of Taos. It is noteworthy that 19% of the hearers perceive the hum at sites more than 50 miles from Taos. Our next goal is to compare low frequency hearing thresholds and other aspects of auditory function in hearers and non-hearers from the Taos region. Informal testing of one hearer provided a tantalizing hint that the sensitivity of hearers in the frequency range from 20 to 100 Hz may be significantly more acute than is implied by some of the widely used sensitivity curves. There we are currently developing equipment for low frequency audiomety as well as equipment to measure distortion product otoacoustic emissions generated by the ear at low frequencies. The measurement of these emissions has become standard clinical practice at frequencies above 1 kHz but to date no one has reported success in detecting evoked emissions or spontaneous emissions in the frequency rang we are investigating. The problem is that the noise floor for the usual insert microphones is very poor at low frequencies so we are using electrodynamic elements, which have orders of magnitude better noise performance.